Located within the variable pitch controller enclosure up-tower, is a Non-volatile Over Speed (NOS) circuit board. This board is designed to feather the turbine during a power outage if the turbine achieves an over-speed condition at the hub. It is also designed to signal the down-tower Winteligence controller that the hub tachometer system used on the NOS board is functioning through a direct hardwire connection to the down-tower Winteligence Relay Input Control Board #2 (ICB 2). A series of problems with these boards has developed over the past 15 years since their manufacturing, including failure of the down-tower signaling transistors, obsolesces of the NOS board processor, and the degradation of the main energy storage capacitor. Re Nu Controls developed a revised NOS board, designed to tackle all of the problems noted above. This board is the same size, uses the same mounting bolts, and same interface connector as the original. It is a true pin-for-pin compatible unit designed to replace the original. The down-tower communication transistor Q3 was replaced by a much larger device with over- current and over-voltage protection. The processor used on the new NOS board is a modern, fully available unit from Microchip. 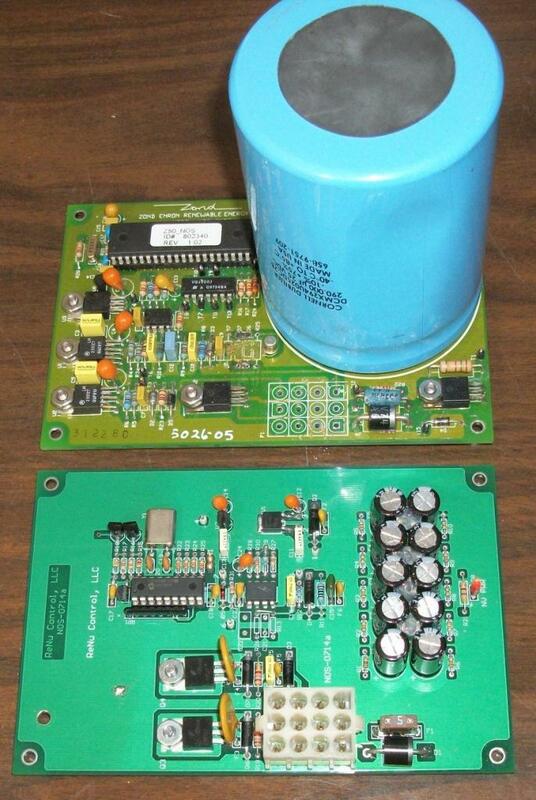 Additionally, the energy storage for this board is provided by modern “super capacitors” with a long life span that meets or exceeds the original storage capacitor. These super-capacitors offer 15% more energy storage in an area occupying only one fifth the original. This is technology that was simply not available in 1997 when the NOS board was designed. More than 30 of these units are operating in the mid-west on both Z48’s and Z50 turbines. Figure 2.0 shows the reduction in components and component size with this new design.